This diffuser is one of the bestselling in the Brooke and Shoals Range. This diffuser has fragranced oils and is alcohol free and we find gives a lovely scent in the home for up to 4 or 5 months. We would describe the scent as very zesty, with a more subtle floral note of magnolia and jasmine. This scent is perfect to help create a relaxing atmosphere. We’ve been a fan of Alison Bantons fragrances for a long time. She is the founder of Brooke and Shoals and often uses childhood inspiration for the fragrances she creates. She often recalls picking flowers in her great-aunt Mollies garden. The garden was near a babbling brook and whispering shoals and this came to form the name of Alisons company in her Aunts honour. 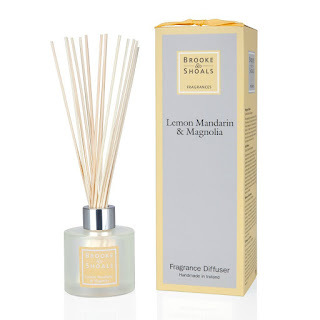 A top tip to maximise your fragrance – We’ve found that turning the reeds upside down from time to time helps. The packet comes with a 4.06 fl.oz bottle and the reeds in a lovely package with a bow on top which makes it a great gift idea.